We are very pleased to be back in the UK after our adventurous October half term, but also very sad to have left Mkanakhoti School, our link school via Starfish Malawi. We had an amazing time with many joyful experiences but also some very sad ones. Children at Mkanakhoti continue to receive a meal of porridge every day thanks to a Government Feeding Programme. For some, this is their only meal of the day. However, despite the extreme poverty, the children all appear very happy. There are no arguments over friendship or football at break times! Mkanakhoti School is going from strength to strength and now has 15 teachers, double the number it had last year. This has enabled the school to split some of the largest classes. Standard 1 has now become Standard 1a and 1b with about 50 pupils in each class, and the same in Standard 3.
taught outside under a tree. While this sounds very pleasant, in actual fact it’s extremely challenging both for the teacher and the pupils. On the day that we observed both these outside classes being taught, the weather was cold and windy which meant that lesson resources were being blown away. This will only get worse in the rainy season. As well as taking out many items of stationery for the school (the children are given one exercise book to last them the whole year, used for every subject) money raised by our Malawi day and disco before half term was used to buy footballs, netballs, buckets and soap. We know that many children in Malawi die because of poor hygiene and ignorance about the importance of handwashing. Although the children were washing their hands before eating their porridge, they were not doing this after using the toilet as there were no facilities available. Water has to be fetched from a pump to fill the buckets. Mrs. Hunt spoke eloquently to school staff, members of the local community and governors about the importance of washing hands thoroughly after using the toilet and the governors have committed to ensuring that the new buckets will be filled every day. We hope that this measure will improved absence due to illness. We were also kindly given a First Aid kit and some extra resources by Sharmans Pharmacy in Northwood. Many thanks to them for their generosity as, again, this will enable children at Mkanakhoti to stay safe and well. During our time at Mkanakhoti we observed in every class and then taught each class. Years 1 to 4 enjoyed listening to and acting out "Handa’s Surprise", Years 5 to 8 looked at photos of Holy Trinity School and discussed similarities and differences. We were extremely warmly received by the whole community who looked after us and showed us so many aspects of life in Malawi. In the Spring of next year we will be collecting clothes to send out to Mknakhoti along with other much-needed items. We will also be holding further fund raising activities during the year to enable a roof to be put on the new classrooms we hope will be built in the Spring. 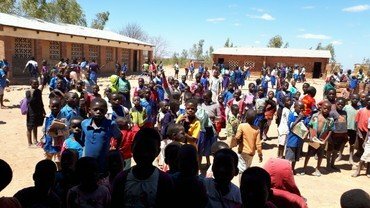 The Malawi government will not fund the classrooms, they will be constructed by the local community with the Holy Trinity community funding the roof. We look forward to being able to tell you more about our experiences and showing you photos. Please join us straight after school at 3.30pm on Friday 30th November for a cup of tea and a chat.